For all of you looking for milk alternatives and are wanting to try something besides soy or almond milk, give this a try. 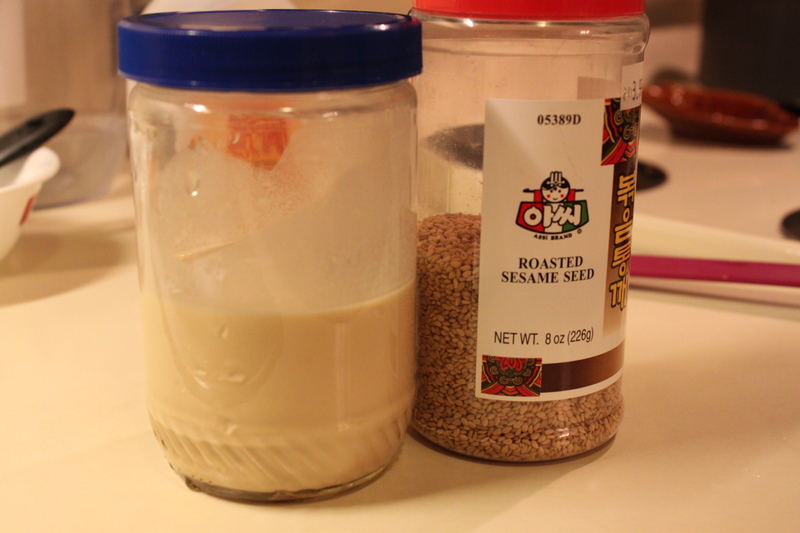 Sesame milk (contains no milk) tastes wonderful and is almost reminiscent of a “peanut-buttery milk”. 1. Toast sesame seeds in oven @ 350 degrees for about 5 minutes. 2. Place all ingredients in Vitamix blender and secure lid. 3. Start machine at Variable 1 and quickly increase to Variable 10. Then, switch to high. 4. 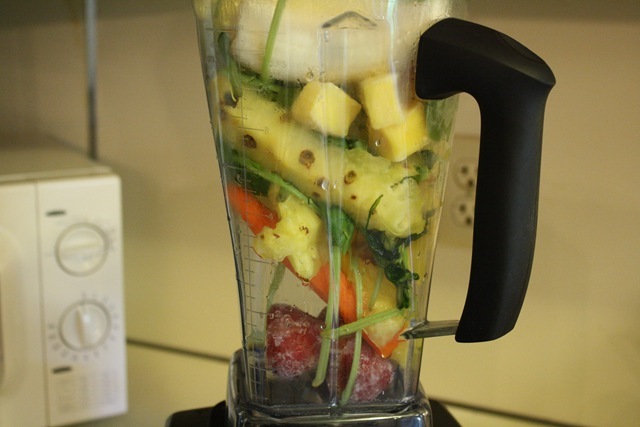 Blend for about 2 minutes or until desired consistency. 5. 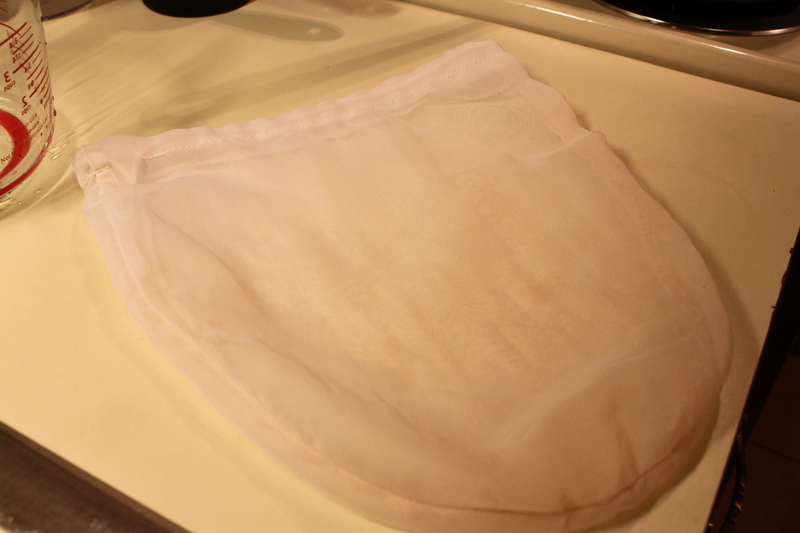 Strain using cheesecloth or nut milk bag (shown below) and/or add sweetener if desired. I used my toaster oven to toast the seeds, so it was pretty quick. 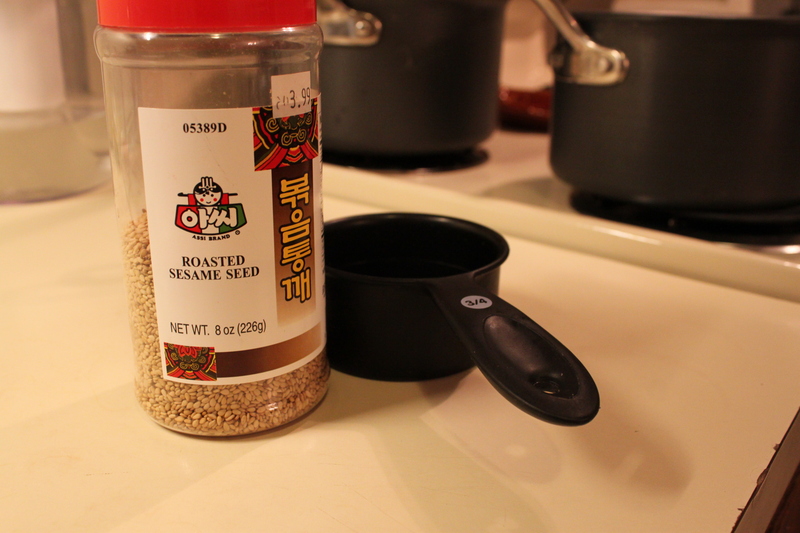 Actually, the sesame seeds that I had were already labeled as “roasted”, but the recipe I used said that toasting seeds improves the slight bitter flavor of the “milk”, so I wasn’t taking any chances. 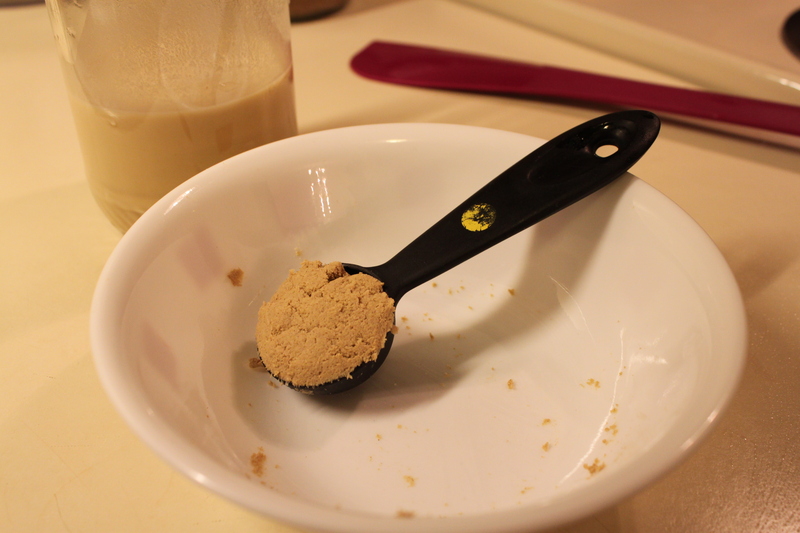 The recipe makes 2 cups, but the batch that I made in the pictures is only 1/2 of the recipe. I made this using my Vitamix. 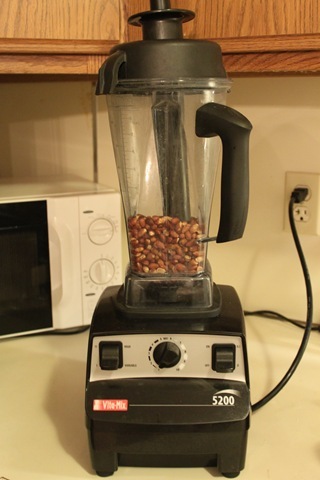 I’m sure you could make it in a regular blender, but because it does require that you blend for about 2 minutes, I would be afraid that a regular blender couldn’t handle it. 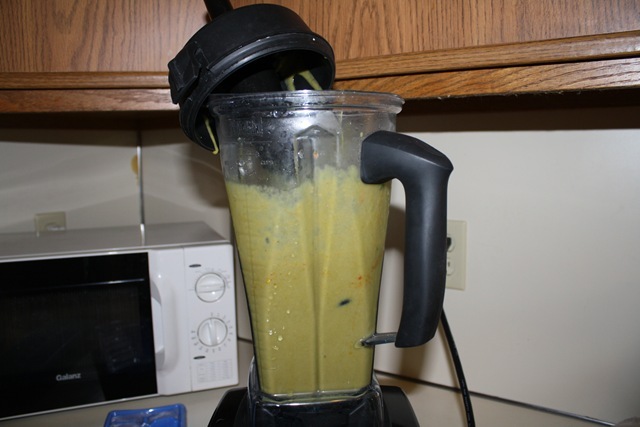 (It was when I tried to make things like this, that I burnt out several “regular” blenders and decided to get a Vitamix. Click here for more information on how to purchase a Vitamix (30-day money back guarantee–so if you don’t like it, you can always send it back–although I doubt you will). Using this link will provide free shipping (a $25 value). 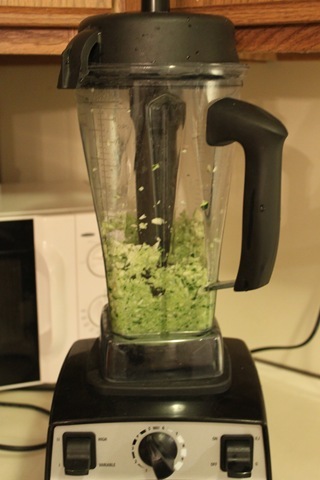 On their website, Vitamix boasts that this amazing “blender” can tackle 52 amazing food feats. Well, I’m proud to say I’ve discovered food feat #53. Before Christmas break, I stuck some apples in the fridge…and forgot about them…until yesterday. Now, when it comes to apples, I’m pretty snobby. I really like a crisp, crunchy apple. I do not do mealy apples. I’ve recently discovered honeycrisp apples (or as R likes to call them: “honeycripsy” apples) and if any of you have ever ate one, you know exactly what a delicious apple should taste like. Sorry Gala and Fuji but I’ve found a new love. But, I deter. Back to the old, mushy apples in the fridge. Yesterday, I pulled them out of the fridge just to see how “bad” they really were. Secretly, I was hoping that they were rotten and I could just toss them. But suprisingly, they “looked” decent. Well, I knew they weren’t good enough for this “apple snob” to eat directly. So, I remembered that I had been wanting to try to make fruit leather from scratch. Do you remember eating Fruit Roll-Ups as a kid? I thought this would be the perfect way to use up my “old” fruit. I fully intended to update you on the progress of my TB30 list the day after my 30th birthday (which was about 2 months ago). Better late than never, huh? Although I wasn’t able to finish everything on my list, it was still loads of fun trying to. Truth be told, a whole fruit juicer had been on my wish list for the last couple of years and my mom knew this. This summer my mom sent me a juicer. She told me they were on promotion: buy 1, get one 50% off. Since this summer, I have probably only used my juicer a dozen or so times. That’s because juicing with the Vitamix is so much easier. If anyone owns a juicer, they probably know what a pain it is to clean up. It takes 5x longer to wash the machine than it does to actually make the juice. I don’t use the dishwasher at my school house, so it also feels like I waste a lot of water to clean the darn machine. After sending some vacuum-sealed baked goods to my sister who is currently serving in Afghanistan only to find out that they arrived 3 weeks later, with mold, I discovered that you could bake cakes in Mason jars and that they would essentially be preserved (due to the sealing of the jars). Read here for my first attempt. My sister did receive the first cake-in-a-jar that I attempted. I mailed the first batch of pineapple cake on October 5. She told me that she opened the jars and ate the cake on October 23, almost 3 weeks later—and they were fresh! So I asked her if she had any requests for the next batch and she said since they don’t have a lot of access to fresh produce and fruit that she would like zucchini bread. So, here is my attempt with zucchini bread in a jar. 1. 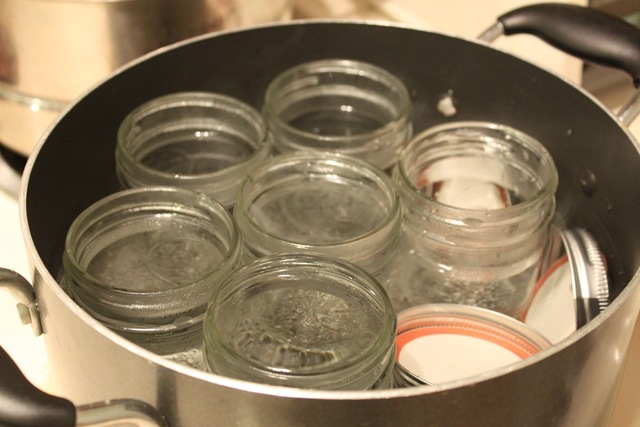 Boil jars, lids and rings for 10 minutes. Dry jars. Leave rings and lids in hot water while preparing the batter. 3. 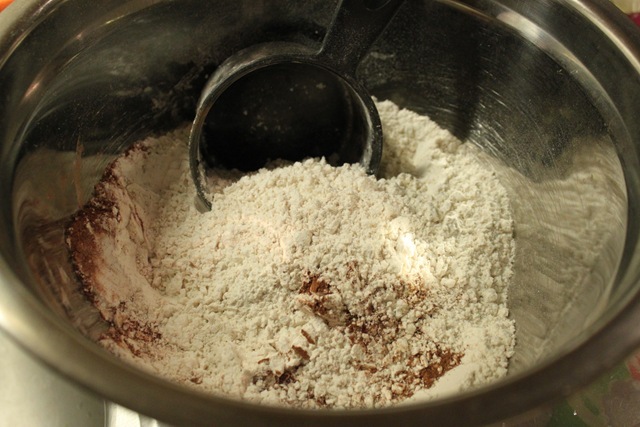 Mix flour, salt, baking soda, baking powder, cinnamon, nutmeg, and cloves in one bowl. 4. Grate zucchini. I used the Vitamix to grate my zucchini. I put the lid on the Vitamix and removed the plug. Turned the Vitamix on to Speed 5-6 and put in the large pieces of zucchini. 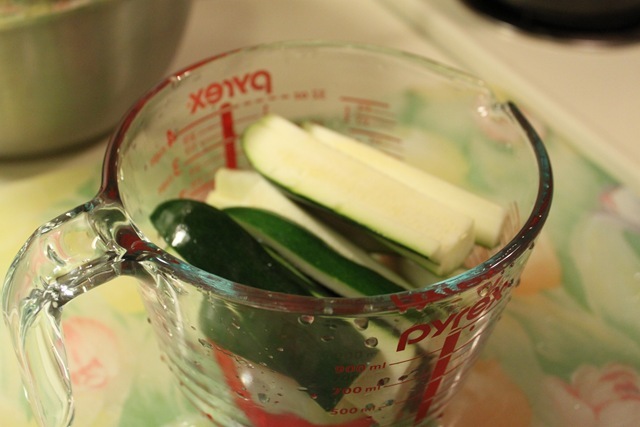 Wah-lah…grated zucchini with no bloody knuckles. So, peanut butter is another of those things that I had been wanting to try to make in the Vitamix, but was waiting until I used up the last of my commercial PB. 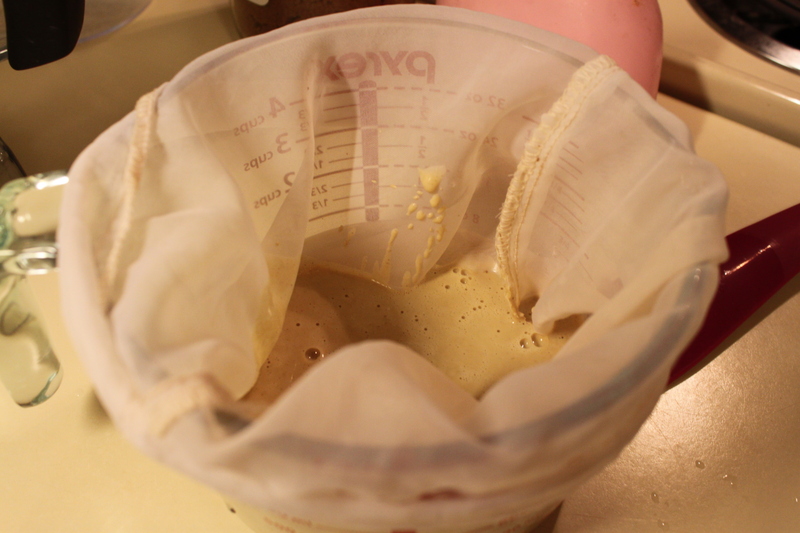 Making homemade peanut butter is too easy not to share how it is done. 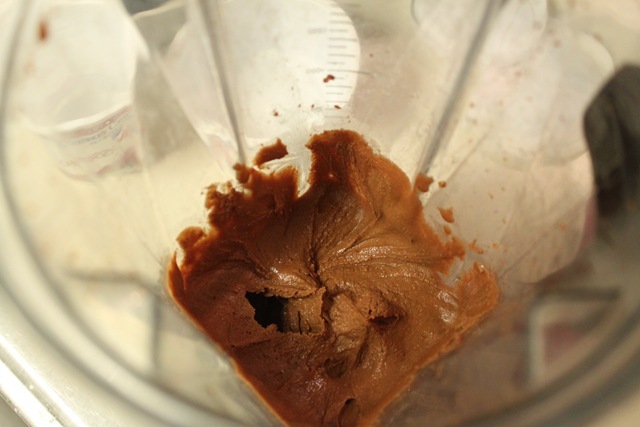 Making your own nut butters can be great, especially if you tend to buy some of the more expensive nut butters like almond butter or cashew butter (which can be made the exact same way as the PB). I knew this was going to be pretty easy, but had no idea it would be this easy. 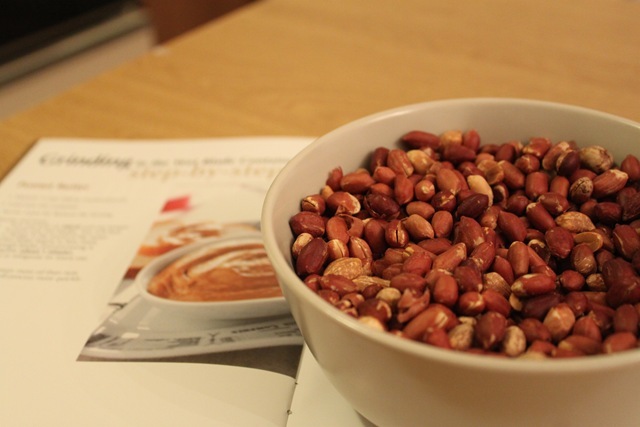 I started with a couple of cups of roasted peanuts. I bought them unshelled (from the Asian market) and roasted them myself (20min in 350 degree oven). I debated taking off the skin, but in the end was too lazy. Put the nuts in the Vitamix. Cover with lid and tamper. Blend on High for 1 minute or so, using tamper to send nuts to blades. 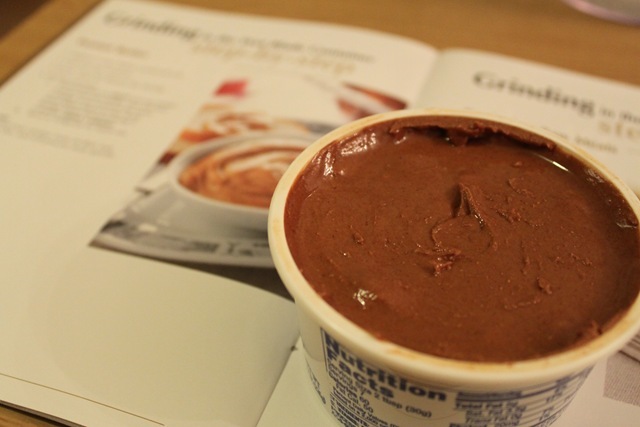 My PB was probably done around 45 seconds, but since this was my first time, I wanted to make sure it was really creamy and blended for the full minute. Here’s what you get. Fresh, homemade creamy peanut butter. R thought I put chocolate into it because it looks darker than commercial PB, but I think it just came out this color because I roasted my nuts a long time and left the peanut skins on (more fiber, right?). 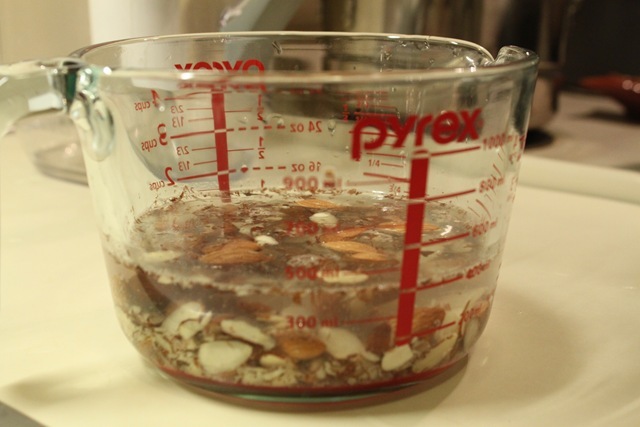 If you want crunchy PB, I suspect you just save some nuts to add in towards the end of the 1-minute blend time. Now, that I know that making nut butters in the VM is super fast and easy, I’m going to try to make cashew, almond, macadamia nut and sunflower seed butters. Oh, you can also add in salt and sugar during the blend if you like, but I prefer au natural. Plus, eaten with apples or bananas, there’s no need for added sugars or salt. 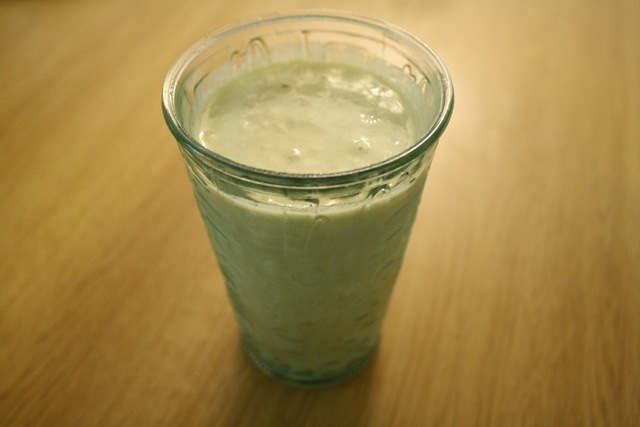 If you have a Vitamix, this is definitely something you should try to make. But I will admit, the normal ‘30-second blending with soapy water’ didn’t quite clean it the same as it does with smoothies. But, every now and then my VM definitely needs a good scrub. I also let it soak with hot, soapy water to get rid of the PB underneath the blades. This worked just fine. Click on the Vitamix button below to order your own or use code 06-005573 at checkout to receive free shipping ($25 value). 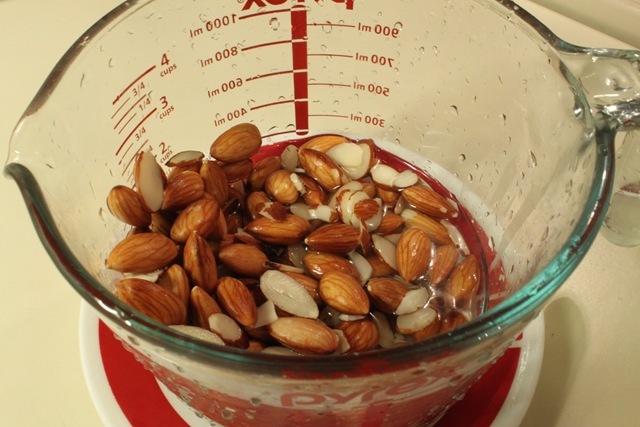 Soak 3/4 cup almonds overnight in water. You can use whole almonds or sliced. I had both, so I used both. After soaking, rinse them until the water runs clear. They will be puffy. The cool fall day today made me really crave soup for dinner. I had bought a big ‘ole bunch of spinach at the Asian market tonight. So, I decided to make a faux cream of spinach soup. This recipe could easily be vegan if made with vegetable broth instead of chicken. I recently visited a cute local vegan/raw cafe with my cubie, F. We shared an lunch entree that included zoodles and an amazing beet salad. We also decided to each order a smoothie. There were so many to select from; I ended up going with the chef’s recommendation, the Tropical Peach, which featured flavors of peaches and basil. I thought it sounded like an interesting combination and wanted to see what it was like. Let me tell you. It was the most refreshing, clean-tasting, delicious creation! 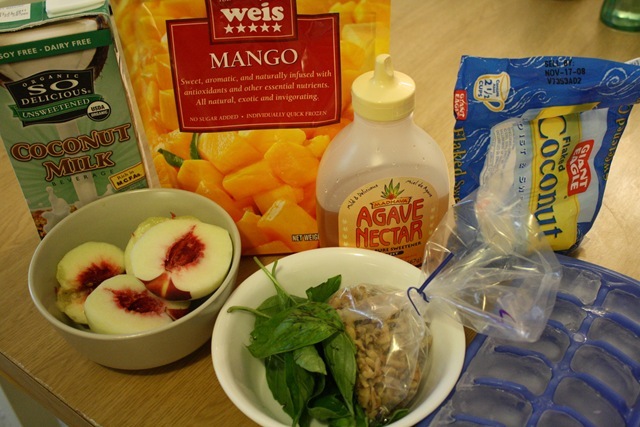 I took note of the ingredients she used to prepare it and rushed to the farmer’s market to buy some local peaches and basil so I could try this at home. I blended everything up in my Vitamix on high for about 30 seconds. I didn’t even have time to garnish the smoothie before R grabbed it up and downed it. By the way, this picture does this smoothie no justice. 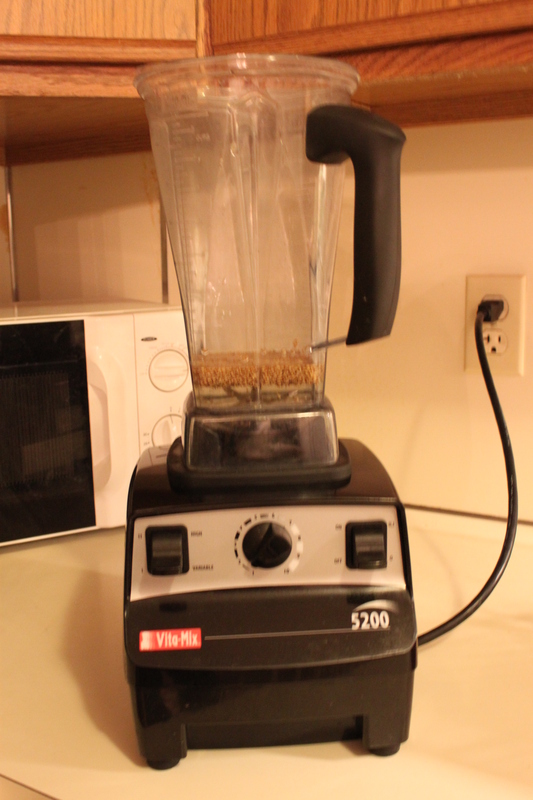 It’s official…I Heart my Vitamix! One of the main reasons I started this blog was to have a way to capture life to share with my baby sister and BIL while they are away in Afghanistan serving our nation. The other main reason is because I wanted to share with everyone my adventures in the kitchen, especially those that involve my Vitamix (VM). If you know me at all, you know how I can’t stop raving about my VM. I joking told a friend that if I had a dollar for each time I mentioned their blender, I wouldn’t need to work. Well, I recently found out that I could promote the VM and the VM lifestyle and potentially earn a dollar. So, I am now officially a Vitamix affiliate, which basically means that I can offer free shipping and handling ($25 value) to anyone who buys a VM through me, using the link on this page (see below) or by using my affiliate code (06-005573) at checkout if buying online. Here’s to living a full life: full stomach, full mind, full heart! I have decided to affectionately refer to my green smoothies as “Shrek Juice”. This morning I made a special batch of Shrek Juice (SJ) to take to work with me. 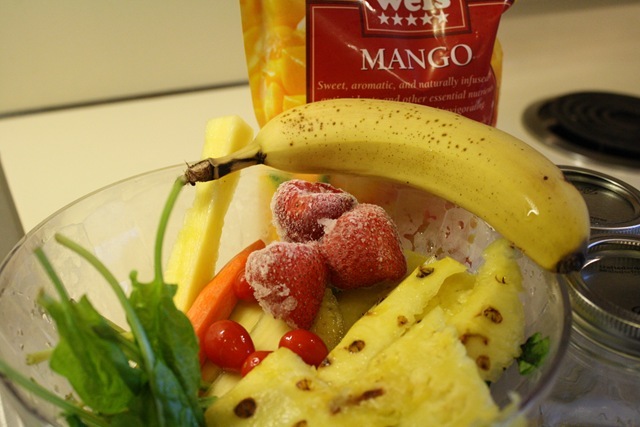 Today’s SJ was made with banana, pineapple (the not pretty part that you don’t want to eat, but is a waste to throw it away), including pineapple core (or pineapple hearts), frozen strawberries, frozen mangos, carrot, grape tomatoes and and the “Shrekiest” of ingredients—a generous handful of spinach! 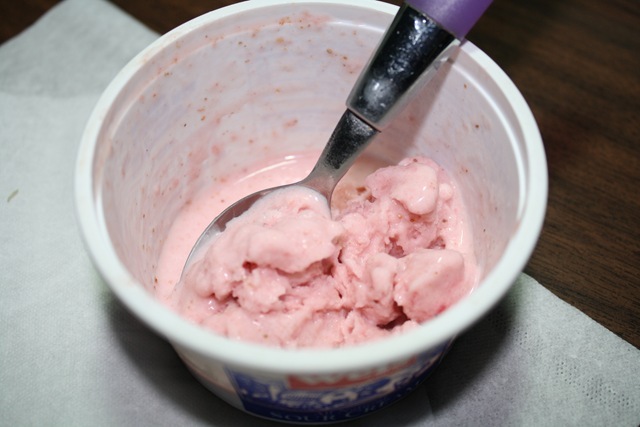 As I sit here writing this post, I am enjoying some luscious homemade strawberry ice cream (made with real cream, not skim milk like I usually do) made in the Vitamix.